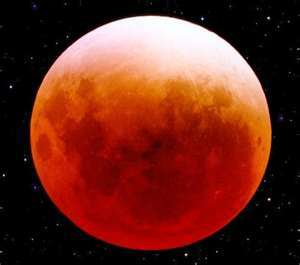 A total lunar eclipse happened last Saturday and the total lunar eclipse of 2011- and the last one until April 15, 2014. I almost forgot about it if I didn’t login to my facebook account and saw the shout out from one of my friend, Kenneth. I shall be thanking Kenneth for posting the latest event and happening in his wall, hehehe… As soon as I read his shout out I immediately asked my Mum to check if the moon is visible for it has been raining for the past couple of days and I thought the moon is hiding in the clouds. But luckily the sky was clear that night so I was able to see the moon turned into a reddish ball. Too bad the little tot and my nephew were sleeping that time so they failed to saw it. I remember the little tot mentioned about witches when he saw the moon few hours before the Lunar eclipse. We were walking on our way home from another barangay with my nephew when the little tot noticed the moon. I am sure he will be happy seeing the moon turning into reddish moon. A lunar eclipse occurs when the Moon passes behind the Earth so that the Earth blocks the Sun's rays from striking the Moon. This can occur only when the Sun, Earth, and Moon are aligned exactly, or very closely so, with the Earth in the middle. Hence, a lunar eclipse can only occur the night of a full moon. The type and length of an eclipse depend upon the Moon's location relative to its orbital nodes.